New Orleans has so much more to offer than the clichés of Bourbon Street, plastic Mardi Gras beads, and beignets. While those are all part of what makes this city so unique, we want to introduce solo travelers to our New Orleans: to our favorite restaurants and bars, to our local fashion designers, to our hidden neighborhood gems. We are here to help solo travelers looking for affordable luxury ideas see another side to New Orleans; one filled with history, culture and life. All while feeling safe, confident, enlightened and inspired. Here are our top 15 things you can totally enjoy by yourself in the city of New Orleans! Commander's Palace, nestled in the middle of the tree-lined Garden District, has been a New Orleans landmark since 1893. Known for its Haute Creole cuisine and whimsical Louisiana charm, Commander's Palace brought back the three-martini lunch, offering 25-cent cocktails along with your midday meal. Don’t miss this upscale lunch, which touts rich Creole dishes, such as panéed veal and crawfish, couchon de lait and hickory-grilled gulf fish, paired with — yes — 25-cent martinis! One block over from the ribaldry that is Bourbon Street lays Royal Street, the French Quarter’s sophisticated and more refined epicenter for local art, antiques, and word-class restaurants. Royal Street is within easy walking distance from any point in the French Quarter, and one can easily spend an afternoon browsing the street’s art numerous galleries, fine jewelry shops, boutiques, bars and restaurants. Check out our guide to Royal Street here. Known for its colorful street murals, the Bywater neighborhood has a bohemian vibe, with plenty of outdoor cafes, boisterous dive bars and hip restaurants. Enjoy brunch at Elizabeth's, famous for its down-home country classics in a 100-year-old bustling space. Or head to The Country Club and enjoy an elegant escape from everyday living. Enjoy American fare and creative cocktails served in the breezy, historical cottage or lounge by the pool and cabana bar. Every Saturday at 11:00 a.m. and 1:00 p.m. The Country Club hosts its whimsical Drag Brunch - a must see! New Orleans is home to multiple parks, with Audubon Park and City Park being the most notable. Audubon Park is home to a two-mile path that circles between Magazine St. and St. Charles Ave. and is perhaps one of the most beautiful places in the city for a morning run or walk. The Uptown portion is always bustling, perfect for a solo traveller looking to get in a workout. City Park is as magical and unique as the city of New Orleans. The 1,300-acre outdoor oasis has enchanted New Orleanians since 1854, making it one of the nation’s oldest urban parks. City Park has something for everyone: botanical and sculpture gardens, the New Orleans Museum of Art, a brand new championship golf course, a beignet and coffee shop and miles of walking, biking, and running trails! Starting at Canal Place in the CBD and running all the way upriver to Audubon Park through the Garden District and Uptown, Magazine Street is a New Orleans staple. Magazine Street is a thriving place of commerce, where you will find world-class shopping, great restaurants and classic New Orleans architecture in a relaxed, local atmosphere. To see our favorites places to shop, drink, and eat, check out our Magazine Street guide here. Year in and year out, the National WW2 Museum is consistently voted one of the best museums in the world. 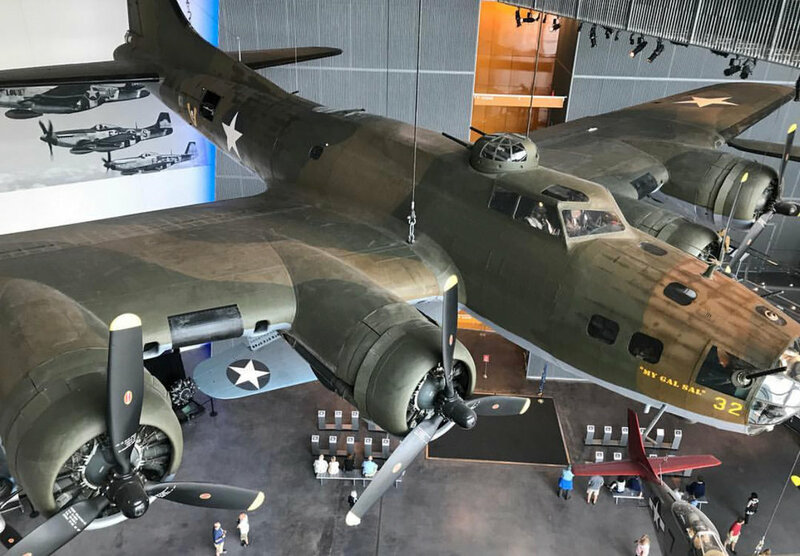 The National WWII Museum is located in the CBD on a six-acre campus, where five soaring pavilions house historical exhibits, on-site restoration work, a period dinner theater, and restaurants. Spend a day learning the story of the American Experience in the war that changed the world - why it was fought, how it was won, and what it means. A must for history buffs and lovers of the city, the Historic New Orleans Collection connects the dots between more than three centuries of New Orleans lore. A museum, research center, and publisher, the Historic New Orleans Collection was founded in 1966 to preserve the history and culture of New Orleans and the Gulf South region. Located in a historic complex of French Quarter buildings, the Historic New Orleans Collection also includes an impressive staffed research center – for doing some checking up on famous residents like voodoo queen Marie Laveau, should you get the urge. The best part? Admission is free! Elegant dining rooms, mahogany walls, and white-gloved waiters - treating yourself at one of New Orleans's classic stalwarts should be on everyone's to-do list. In the French Quarter: Enjoy French-Creole favorites at French Quarter staples Galatoire's and Antoine's. Uptown: Enjoy elegant Creole classics at Clancy's and Upperline. Our favorite fine dining options: Commander's Palace, Bayona, Arnaud's, Restaurant Revolution, Doris Metropolitan, and La Petite Grocery! Oak Alley Plantation. Photo by gabe popa via flickr. To get a first-hand look at Louisiana’s colonial and antebellum past, visitors only need to take a drive down River Road. Just 20 miles outside of New Orleans, Destrehan Plantation dates back to 1787 and is the oldest documented plantation in the lower Mississippi Valley. Just upriver is San Francisco Plantation, the most distinctive of the restored plantations on River Road. Noted for its lavish and intricate interior painting, the home was built in mid-1800s. Cross the bridge near Gramercy and head west to Oak Alley Plantation, named for the quarter-mile entrance canopy of 300-year-old oak trees. A 40-minute tour given by costumed guides chronicles the history of the elaborate mansion that was built in 1837. Next door to Oak Alley is St. Joseph Plantation, one of the most complete plantation homes on River Road. Enjoy a cocktail in one of New Orlean’s famous bars. Order a refreshing Pimm's Cup from Napoleon House or a classic French 75 from Hotel Monteleone's Carousel Bar! Take your cocktail to-go, and sip as you stroll along the streets of the French Quarter. From there, hop on the street car and take a ride Uptown to the Garden District where the gorgeous mansions and stately oaks are a delight. Take a break and enjoy a snack and drink on the front porch of The Columns. Note: While it is perfectly legal to walk the streets with your to-go cocktail, we’ve been informed that you will not be allowed to ride the streetcar with your drink. A beautiful charcuterie board from Bacchanal which has live music 7 nights a week! For something a little more off the beaten path, check out Bacchanal, “NOLA’s Backyard Party”, in the Bywater. This little hole-in-the-wall is a total hidden gem. Nestled in a somewhat questionable looking neighborhood, you might begin to wonder if you’ve come to the right place. Trust us, you have. Bacchanal serves amazing wine which you may purchase by the glass or bottle and pair with a charcuterie board with meats and cheese of your choosing. Since 1967, the New Orleans Saints have been a Crescent City institution. Attending games in the iconic Superdome is a rite of passage and an opportunity you won't want to miss. People from all walks of life converge to create a festive and fun game day experience, one that makes for a great solo travel adventure. Read our complete guide to Saints's game here. When in New Orleans, listening to live music is a must. After all, this is the birthplace of jazz! Beyond that, New Orleans is home to a seemingly endless number of talented local musicians and artists. Jazz: If jazz is what you’re looking for, Preservation Jazz Hall is an amazing place to listen to some of the city’s best performers. Even with 5 shows every night, this venue can fill up very quickly; however, you can purchase reserved seats in advance. For more information, check out their website. Local Variety: Another great option is to head to Frenchmen Street and take in some local, live jazz at one of the many restaurants and bars. Read more about Frenchmen Street here! Elegant Atmosphere: For something a little more poised than the “standing room only” bars, head to the Davenport Lounge at the Ritz Carlton. Featuring live entertainment from renowned musician Jeremy Davenport Wednesdays and Thursdays 5:30 p.m. to 9 p.m. and Fridays and Saturdays 9 p.m. to 1 a.m., the lounge offers a menu of classic New Orleans cocktails, wine, champagne and light fare. New Orleans has a rich and somewhat dark history. Being three centuries old, it should come as no surprise that New Orleans is perhaps America's most haunted city. Spend a night walking around the French Quarter, the city's oldest neighborhood and epicenter for paranormal activity, and you will see why many people make this claim. If you're a solo traveler in town, we highly recommend joining one of the French Quarter's world famous ghost tours, especially if you are planning on taking in New Orleans's haunted sites at night. Desserts in New Orleans are just as iconic as the savory main dishes! Enjoy blowtorched Bananas Foster at Brennan's and Bread Pudding at Bon Ton Cafe. Be sure to try New Orleans iconic desserts like pralines (prah - lean) and beignets (ben - yay). Head to Sucré to indulge in melt-in-your-mouth macarons and head to Angelo Brocato's or Creole Creamery for your ice cream cravings! Don’t miss out on your chance to try an authentic New Orleans snowball (not to be confused with a snowcone) at Hansen’s Sno-Bliz! New Orleans is the Festival Capital of the world! On any weekend you choose to visit, there is sure to be some kind of festival going on. Nowhere else on the planet is there a greater selection and wider diversity of fabulous special events than those in New Orleans. Whether you're into music, art, or historic literature, there is a New Orleans festival for you! To see a full list, click here.